Roving Bandit: What will it cost to eliminate poverty? Development Initiatives have a new report out today with, complete with some good-looking charts, reviewing the global picture of financing for development. A couple of charts really stand out. First this one, showing the depth of poverty. 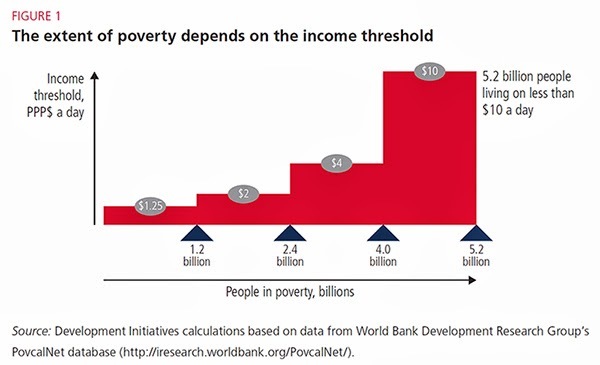 Ending "extreme" poverty - the 1.2 billion below $1.25 a day is feasible by 2030, but there are 5.2 billion living on less than $10 a day, which is roughly the poverty line in most rich countries. Second, this one, showing the level of per capita government spending. 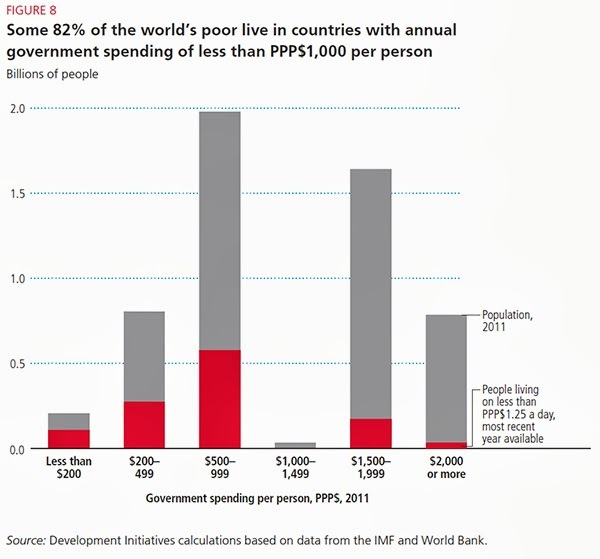 82% of the world's poor live in countries with annual spending below $1,000 per person. I'm not so sure what to make of this. For those in countries with spending below $500, which looks like around half of the global poor, this puts paid to the notion that the poor all now live in middle income countries that should be funding their own social programmes without aid. For those closer to the $1,000 mark, this is still really a pittance, but it's also more than enough to bring individuals above the poverty line with a direct cash transfer. How does it feel to live on less than $1.25 a day in a country where the government spends twice that much for you on public services?